Now that check processing rules have changed to require MICR reading as well as image capture, the Epson CaptureOne is a unit best suited for high volume applications. 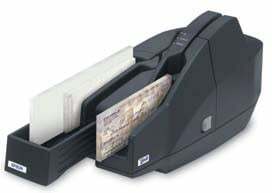 With a 100 check hopper you can read and image batches of checks quickly and accurately. The obvious candidate for this type of device is a bank, but payday loan processors and larger retailers can greatly benefit as well. Compared to competing devices, the CaptureOne has a greater capacity, faster speed, and comes in at a lower cost. If your business is processing any greater volume checks the Epson CaptureOne will get things done faster and without errors.